Westslope Cutthroat Trout (Oncorhynchus clarkii lewisi) are native in Alberta to the Bow and Oldman river drainages and genetically pure populations currently occupy less than five percent of their original distribution. The remaining pure-strain populations are small and disconnected found only in the upper reaches of the Rocky Mountain and foothills headwaters. Westslope cutthroat trout are one piece of Alberta’s complex headwaters ecosystem puzzle. Recovering threatened trout populations by protecting and restoring their habitat will benefit many other species, including humans. 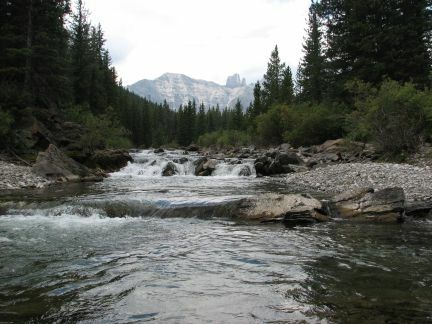 Streams and waterways containing westslope cutthroat trout become the rivers and drinking water sources on which millions of Albertans and other Canadians depend. Due to their sensitivity to water quality and temperature changes, westslope cutthroat trout and other native fish are excellent indicators of watershed health. Like a canary in a coal mine, declining populations of westslope cutthroat trout should raise alarms that Albertans need to stop harmful activities in our watersheds and start treating our most precious resource–water—with the care, love, and respect it deserves. AWA believes that, now Alberta’s westslope cutthroat trout is provincially and federally designated as threatened, a recovery plan developed, and a critical habitat order issued, protection and restoration of this species and its habitat should be effectively implemented. Recovery of the species must be more than just a paper exercise; it will require significant changes to the way in which the forested headwaters are managed. Forest management practices will need to be greatly improved if this species is ever to stand a chance of recovering. Westslope cutthroat trout are formally listed as “threatened” under Alberta’s Wildlife Act. It is also designated as “threatened” under the federal Species at Risk Act (SARA). This came seven years after the Committee on the Status of Endangered Wildlife in Canada called for the threatened designation. The designation was made because native populations of this fish have been “drastically reduced, by almost 80%, due to over-exploitation, habitat degradation and hybridization/competition with non-native trout.” Under SARA the threatened designation means that a wildlife species is likely to become endangered if nothing is done to reverse the factors threatening it. A joint federal-provincial multi-stakeholder recovery team was established in 2009 to develop a recovery plan/strategy that would satisfy both provincial and federal requirements. In 2013, the Alberta Westslope Cutthroat Trout Recovery Plan 2012-2017 was released and a year later the federal Recovery Strategy for Alberta Populations of Westslope Cutthroat Trout was made public. The federal strategy adopted the full provincial recovery plan with the addition of critical habitat identification, as required under SARA. A Critical Habitat Population Order was issued for the westslope cutthroat trout, Alberta populations at the end of 2015. The Order engages section 58(1) of SARA which prohibits a person from destroying the functions, features and attributes of westslope cutthroat critical habitat identified in the Order. A person who contravenes section 58(1) is liable to a fine of up to $1,000,000 or imprisonment up to 5 years. Overharvesting and poaching initiated the problem with these fish many years ago, and poaching still contributes to the problems they are having. The major issues arise from continuing habitat destruction and degradation from resource development. The resulting network of roads also creates access for off-road vehicle traffic, impacting otherwise remote, small streams. This further degrades sensitive habitat and increases angling pressure. The continued failure to address hybridization and competition with exotic species is also a threat to cutthroats. The vast majority of Alberta populations are now extensively hybridized with rainbow trout, which are native in this province only to a part of the upper Athabasca River drainage, but have been widely introduced elsewhere. In other words, most cutthroat populations in Alberta now are a completely different “species.” That is why it is so critical to protect the few remaining genetically-pure native populations. There is some evidence that cutthroats are competitively displaced by widely introduced brook trout and brown trout, both of which, like rainbows, are not native to our cutthroat drainages. The mechanism of displacement is not entirely clear, and requires more research, but is probably exacerbated by widespread habitat disruption. Cutthroat trout require cold water to live and to spawn. Removal of shade adjacent to rivers and creeks risks raising water temperatures to a level which the fish cannot endure. Added to this is the potential impact of climate change. Warmer winters, changing snowpack and changing precipitation could have a negative impact on remaining trout habitat. Despite the name “Westslope,” this species occurs in Alberta on the Eastern Slopes of the Rocky Mountains. The name “cutthroat” refers to the brilliant orange slashes on the underside of the jaw. The presence of orange-red slashes beneath the jaw distinguishes the cutthroat from its close relative, rainbow trout. They can grow to a length of anywhere between 15 to 102 cm, depending on habitat and food availability. Body colour ranges from silver to yellowish-green with red on the front and sides of the head. Westslope cutthroat trout thrive in cold, clean, moving water with various forms of cover such as undercut banks, pool-riffle habitat and riparian vegetation. 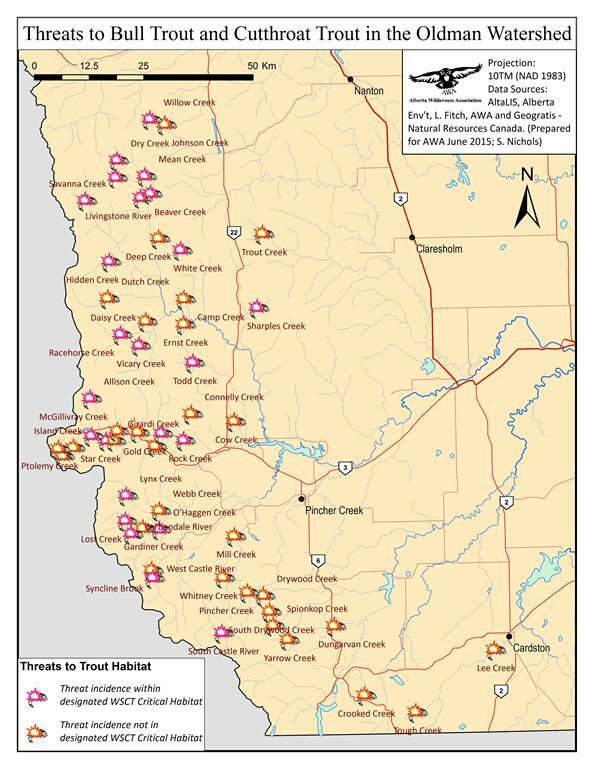 A Critical Habitat Population Order was issued for the westslope cutthroat trout, Alberta populations. The Order engages section 58(1) of SARA which prohibits a person from destroying the functions, features and attributes of westslope cutthroat critical habitat identified in the Order. A person who contravenes section 58(1) is liable to a fine of up to $1,000,000 or imprisonment up to 5 years. Shaun Fluker filed a notice of application on behalf of AWA and Timberwolf compelling the DFO Minister to issue a critical habitat order within 30 days of the date of the Court’s judgment. DFO Minister replied to AWA and Timberwolf’s March 2015 petition letter, stating that work on the critical habitat order is ongoing and that in the interim sections 32 and 33 of SARA and section 35 of the Fisheries Act protect critical habitat for the Alberta population of Westlope Cutthroat Trout. The Minister’s reply essentially replicated what the AWA had already been told by officials with DFO in relation to the absence of a critical habitat order. AWA and Timberwolf retained University of Calgary Faculty of Law Professor Shaun Fluker as our lawyer. 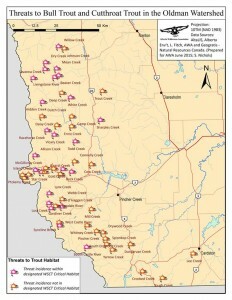 With the guidance of him and his law students, AWA and Timberwolf submitted a letter to the Minister petitioning for a critical habitat protection order for the Alberta population of Westslope Cutthroat Trout as required under section 58(5)(a) of SARA to be issued within 180 days after the final recovery strategy is published. The 180-day statutory deadline expired on September 24, 2014. AWA and Timberwolf requested that the order be issued on or before April 30, 2015. 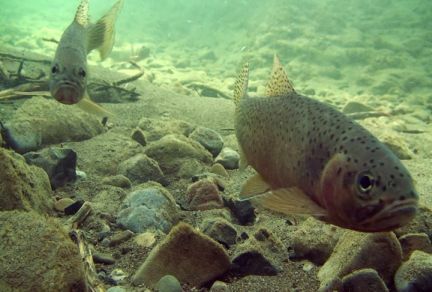 DFO responded to AWA indicating they were hopeful the critical habitat order would be issued soon and in the interim the Fisheries Act and sections 32 and 33 of SARA protect individual westslope cutthroat trout and their habitat. AWA teamed up with Timberwolf Wilderness Society and sent a joint letter to DFO reiterating concerns about the lack of recovery progress and specific timelines. We requested a justification as to the delay in issuing a critical habitat order for westslope cutthroat trout. AWA wrote to DFO to receive an update on DFO’s progress since the November 2014 meeting and to reiterate the urgency to issue a critical habitat order for westslope cutthroat trout because AWA believed ongoing activity was threatening their critical habitat. AWA met with officials from DFO, where concerns were restated regarding the critical habitat in the Recovery Strategy. AWA was informed by DFO staff during the meeting that a critical habitat order had not been issued for westslope cutthroat trout. Discussions at this meeting led AWA to believe that a critical habitat order under section 58 of SARA would be put in place by end of March 2015. AWA received a response from the Minister regarding the June 2014 letter. The Minister stated that DFO was reviewing our concerns and would contact the AWA to discuss issues further. AWA sent a letter to the Minister regarding the Recovery Strategy. AWA believed the Recovery Strategy had failed to adequately identify critical habitat for westslope cutthroat trout. AWA asked the Minister for a satisfactory response by September 23, 2014. The federal Recovery Strategy for Alberta Populations of Westslope Cutthroat Trout was released on the Species at Risk Public Registry. 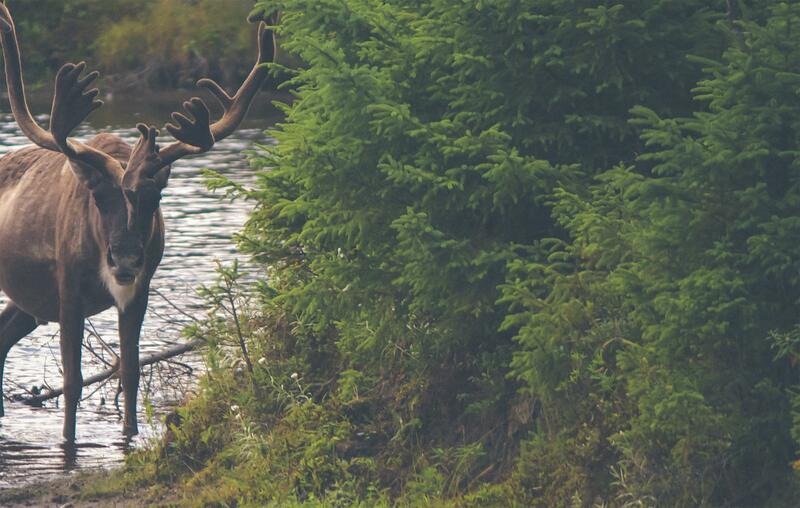 AWA submits comments on the proposed federal recovery strategy, with concerns regarding the critical habitat designation lacking important components. A proposed federal recovery strategy for threatened westslope cutthroat trout (Alberta populations) was released under the Species at Risk Act (SARA). Alberta’s Westslope cutthroat trout is finally designated a threatened species under the federal Species at Risk Act. This comes seven years after the designation was recommended by the Committee on the Status of Endangered Wildlife in Canada. The Recovery Team releases Alberta Westslope Cutthroat Trout Recovery Plan 2012-2017. The Recovery Team submits its draft Recovery Plan for westslope cutthroat trout. A joint federal-provincial multi-stakeholder recovery team is established for westslope cutthroat trout. The team will take two years to produce a recovery plan for the species. Representation on the team includes both federal and provincial staff as well as key stakeholders such as the forestry and oil and gas industries, biologists, and environmental non-government organizations. AWA requests Endangered status for Westslope Cutthroat Trout (Oncorhynchus clarkii lewisi) in Alberta. Fisheries and Oceans Canada conduct consultations on whether the Westslope Cutthroat Trout (Alberta populations) should be added to the SARA list. Their consultation document states that “all available information suggests that many populations are lower relative to historic levels and numerous local extinctions have occurred.” The document further clarifies the source of the problem by stating that “habitat degradation and loss due to timber extraction, mining and hydroelectric developments have been directly responsible for loss of habitat and decline of several populations.” Also of great concern has been the introduction of non-native competitive species that have taken a toll on the existing native cutthroat trout fishery. AWA submits response to the workbook and encourages others to do so as well. Angling for Westslope Cutthroats in Alberta is restricted to catch-and-release in some streams, but primarily by minimum size limits that are larger than most (quite often all) fish in particular creeks for which the regulations are written. Angling opens in most cutthroat streams on June 16 every year, and closes in most on Oct 31. The spring date, however, is after the spawning period for cutthroats in most streams.